1945 Iowa Registration/inspection sticker - $20.00 : Bob Hoyts Classic Inspection Stickers, Add a Final Touch to your Restoration! 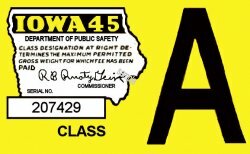 This 1945 Iowa registration sticker validated the 1945 Iowa license registration. It also passed inspection which was required to obtain registration. For an additional $10.00 you can have your license plate number on the white panel where the number appears. This is a "Peel and stick" sticker and it adheres to the inside windshield. This site features Repro VIN tags, replacement car parts, build sheets from 1950-1986. Mostly Ford Mustang and Cougar.